"But how do you know that they'll learn everything they need to learn?" 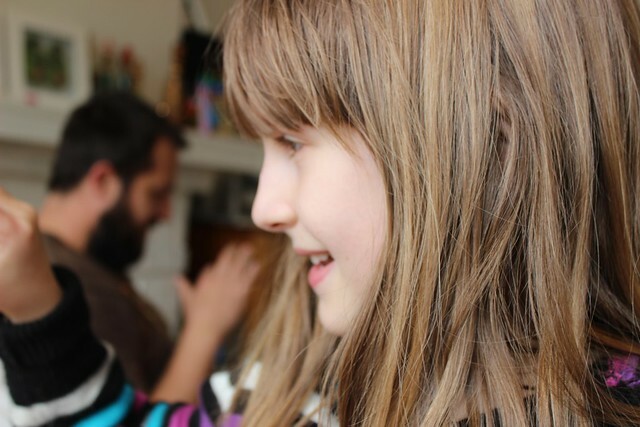 This is one of the most frequent questions we're asked as unschooling parents. The answer is quite straight forward... If we encourage them to follow their interests, they'll pick up or ask to learn what they need to along the way to getting wherever it is they are going. 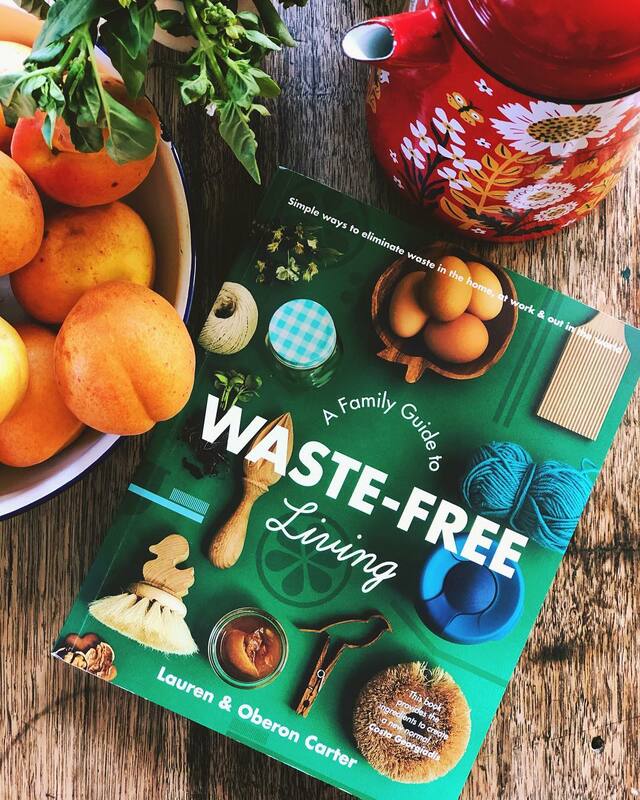 We don't know where that is, so putting them in a classroom, or at home, with a set of arbitrary goals for them to attain and a pre-ordained path for them to follow may not be the best use of their time or enthusiasm. We have no idea when certain concepts will be relevant to them, enough so that they grasp them. We have a fair idea that pushing them to learn before they are ready to understand is quite futile. We don't teach our children to crawl, walk or talk... why do we teach them to read? And why do we expect that they will all do it at the same time? Little Owlet was ready to learn how to write a lower case 'e' on Thursday at approximately 3.20pm. I was unwell and idle parenting was very much on the agenda. I sat down with a cup of tea, rolled my jeans up to my knees and handed the two smallest owlets a pack of face paints. 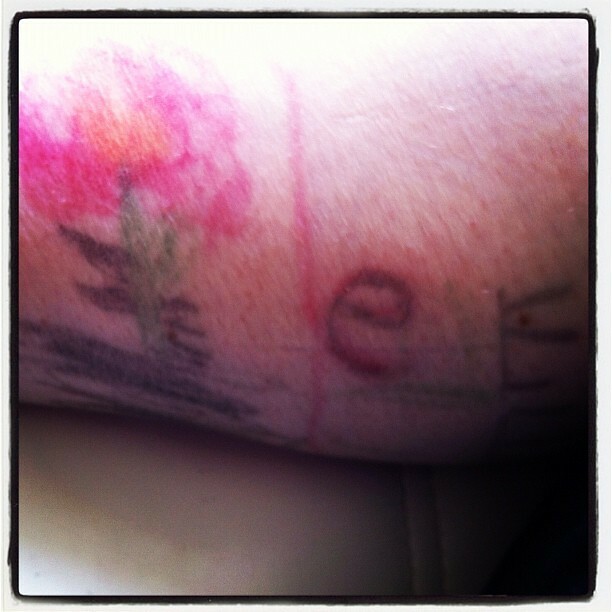 They delighted in drawing all over my legs and after a little while, I could hear Little Owlet writing out letters, saying them as she went along, and then... "Mama, how do you write a lower case 'e'? This is the first time she's expressed an understanding that there even is a lower case of letters. She seems to have picked it up by osmosis, as owlets often do. I showed her the shape with my fingers, as seems to work best for Little Owlet. "Uh-huh!" She said as she went about writing it... Sure enough, half an hour later I noticed it. The perfect 'e'. In this moment, Little Owlet is pottering away, doing everything she needs to gain the knowledge to pursue her interests. It's slow and incremental, so we may not notice it all the time, but the learning is happening as part of the living. As part of the being. As for what Little Owlet is becoming? That is yet to be decided. But, if she follows her heart's desires, and if we are able to provide access to them, where possible, the sky is the limit. And the lessons required to get there will happen along the way... We, as adults, are not generally working towards one particular thing that we'll do forever and never learn anything or move beyond that. We are always learning and striving for new information, new ways to do things and new ways of being. We prefer to remove the focus from Little Owlet's future life and provide learning opportunities for her right now. This moment that she is in. What does she need to learn and do and be in *this* moment? 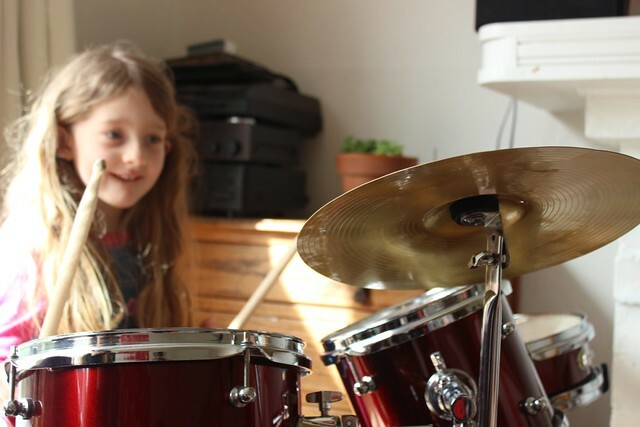 This week she is a drummer. 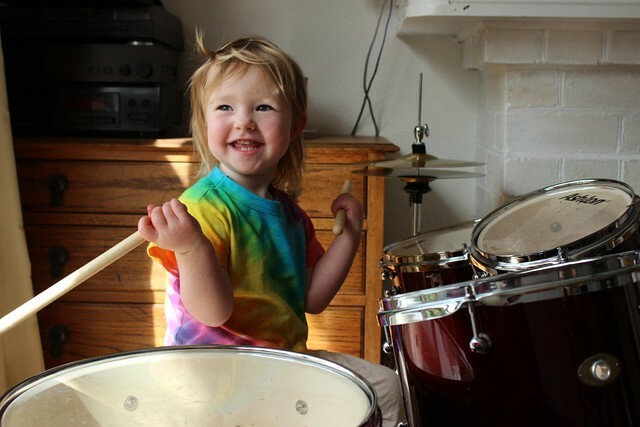 She's always responded to drums, always drums along with music. She loves nothing more than to make a loud noise on the pots and pans. I have the dented pots to prove it. 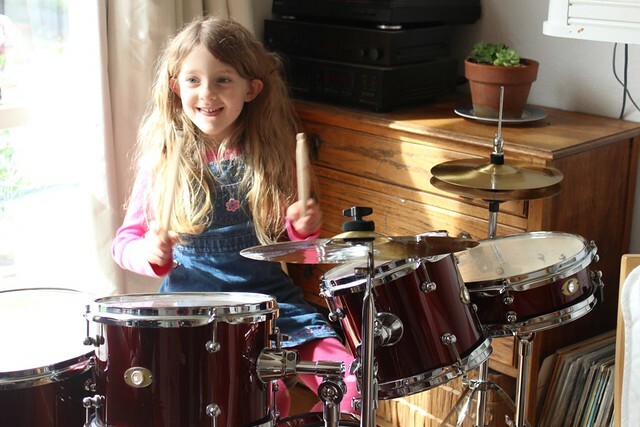 So this week we found her a decent second hand drum kit. 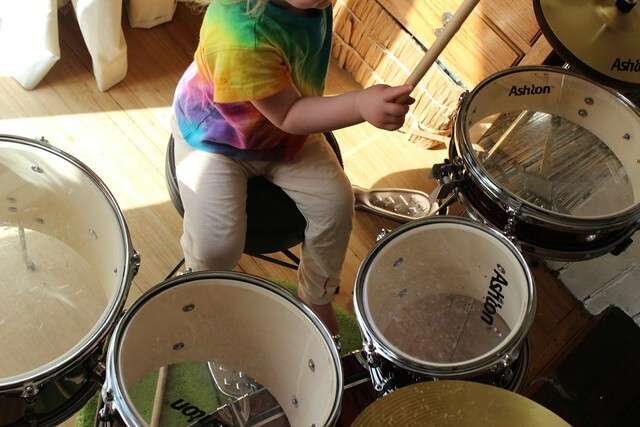 Will she become a drummer? I don't know. But she is one now. And that's important. As for the others? Well, Tiny is a natural. 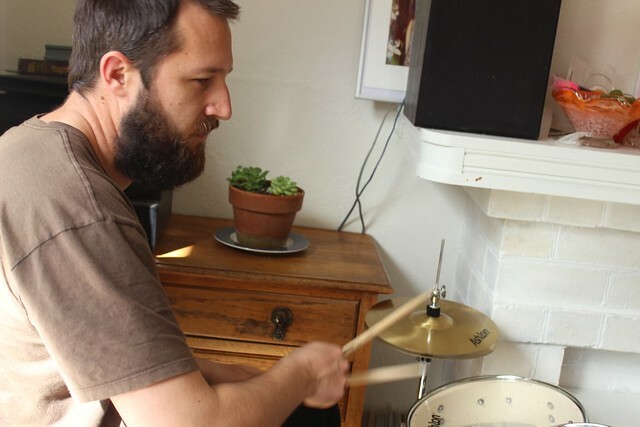 Huz is having a blast making up some new beats and finally indulging in some time at the drums... Something he's always felt drawn to, but never had the opportunity until now. Big Owlet sees herself as a guitarist and singer, so enjoys the odd play and observing the others. 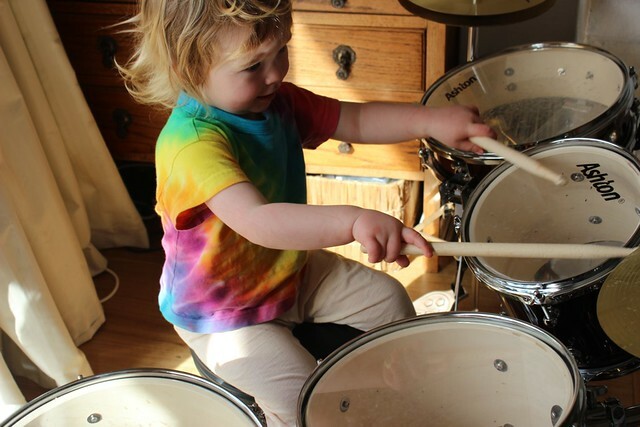 She's not a drummer right now... but she might become one, one day. What do you think? Are you on the path to becoming something in particular? Or are you just being and learning as you go? We're rather keen to see this film, "Being and Becoming". All about choosing not to school, but to follow our children's passions. It looks fab. I love the philosophy of learning things for right now. These skills will be so valuable in later life too, but THE skill, or learning things because you're interested in them will be a huge service to them as they get older, and need to adapt and change what they know quickly! Also, OMG how BIG does Tiny look playing those drums!! Not even a wiff of a baby there!! 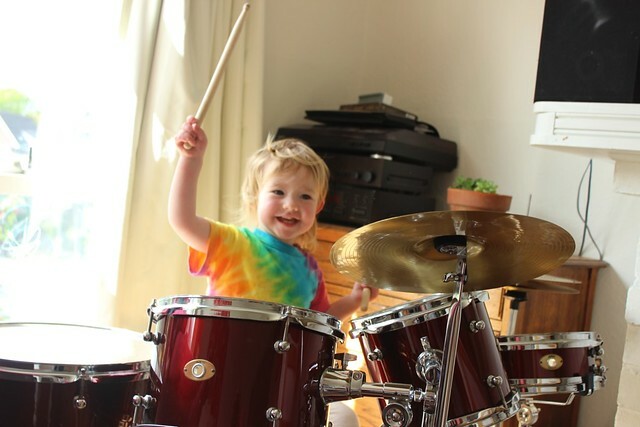 Your drum set looks like so much fun!